Has America Been Made Great Again? As I watched President Donald Trump make his entrance to his first State of the Union address on the night of Tuesday, January 30th, I had no idea what to expect. Would it be his usual, brash, self? Or would he make an effort to act a little more Presidential? As he is the President after all. The speech ran for an hour and twenty minutes, the third longest State of the Union in the past 50 years. Was the length of the speech an indicator of its effectiveness? That’s for you to decide; while I’ll try to discuss some of the key moments and talking points of the Donald’s address. 45.6 million? Pretty good. 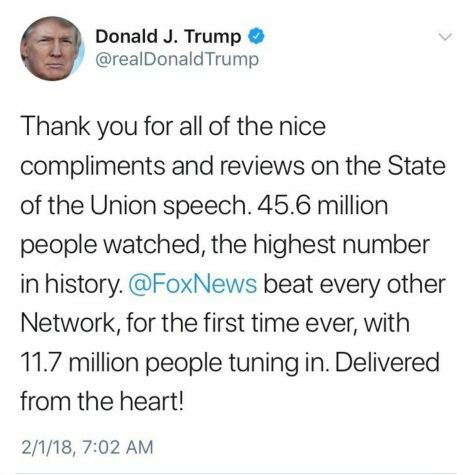 Contrary to Trump’s tweet, though, it still doesn’t make it the most watched State of the Union. The biggest theme of the night was clearly domestic policy, as Trump did his best to articulate a message of putting America first. His most memorable line in terms of this theme was when he said, “Americans are dreamers, too,” a seemingly direct call out to many Democrats and immigrants with regards to the recent DACA reform, trying to argue that his decision to cut the Dreamer’s Program was an effort to protect American citizens, not hurt people trying to make a better life for themselves in the United States. While this may be true, Trump would have been more effective had he just flat out discussed the issue in his speech, rather than just making a quick reference to it. But hey, I’m not the guy getting paid to write his speeches, so I’ll leave it at that. President Trump also managed to spend plenty of time, as most Presidents have in years past, list off stats about how great the country is doing with unemployment rates, the economy as a whole, and more topics of that nature. 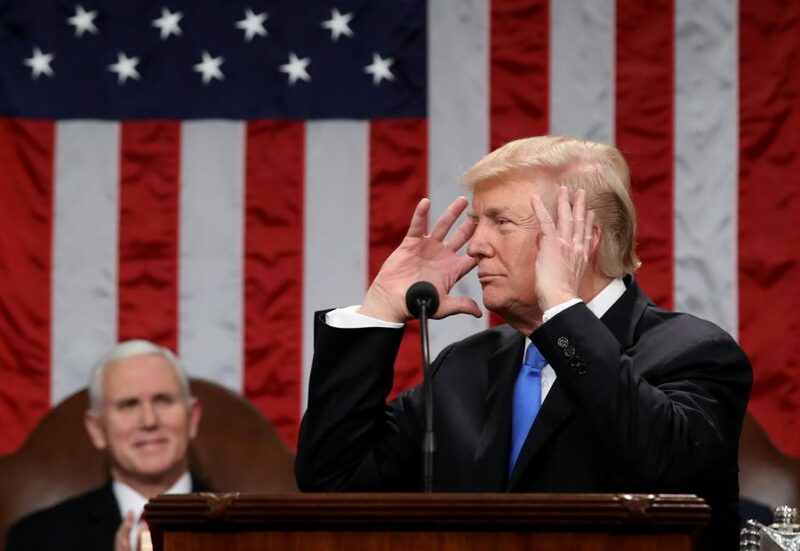 In CNN’s “Six Takeaways from Donald Trump’s First State of the Union Speech”, they were not too happy with the prolonged discussion of his own accomplishments, writing, “Trump’s speech was 80 % celebration of what he has done and 20 % talking about what he would like to do.” While the numbers probably weren’t this tilted, Trump’s pandering went on for much longer than most people would have wanted, as there was definitely other subject matter to discuss. Much of the speech consisted of many idealistic statements that did not sound very “Trumpian”. On many occasions he would say things that sounded fantastic but would never happen in today’s political climate and not to mention pretty hypocritical compared to what he has done in his first year in office. When discussing bipartisanship, for example, Trump said, “Tonight, I call upon all of us to set aside our differences, to seek out common ground, and to summon the unity we need to deliver for the people we were elected to serve.” Whoever wrote that line for Trump needs to remind him that those exact ideals are what a President needs to strive for. The tweets and other sometimes uncivil comments that Trump has made about many politicians throughout his time as President will not make it easy to get Democrats and Republicans to work together, but if he truly stands by this statement then we can only hope that he will follow through with it. Unfortunately, though, it’s likely that these unifying statements were only what Trump was told to say to make a good speech, not a great country. 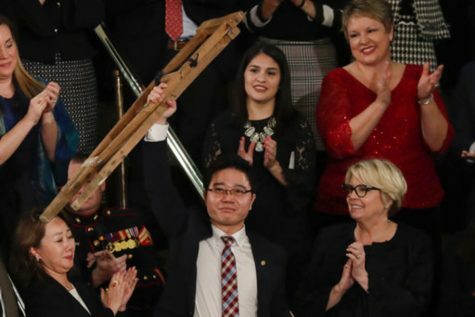 Ji Seong-ho raised his crutches above his head as President Trump honored him. Batson’s argument is one that many people can relate to. Lots of what Trump said in his speech did not seem to hold much weight, as he made general, patriotic statements that did not have much to do with unifying a very divided Washington. The President was able to work in plenty of shout outs throughout his speech. One of the more moving moments was when he gave praise to North Korean defector Ji Seong-ho, who managed to escape the country after getting run,” over by a train and eating nothing but dirt for several weeks. Trump said of the defector, “Seong-ho’s story is a testament to the yearning of every human soul to live in freedom.” While this was a very touching sentiment, it doesn’t do much in the way of actually laying out a plan or policy. Anyone can recognize a brave journey and escape from a dictatorship, but what a President needs to be able to do is state what they plan to do for the country, not look back on past achievements. Overall, Trump’s State of the Union was not a failure. This basically means he didn’t really offend anyone, call any countries “sh*tholes”, or poke fun at an American war hero. On the other hand, the speech cannot be called a success. No new ground was made, and any real discussion of future plans was lacking. At the end of the day, it was just a speech, and what really matters is what he does on a day to day basis as President of the United States, not who he impresses as he reads from a teleprompter for two hours on a random Tuesday night. My advice to the Donald: stop tweeting and just be President for a while, try it out and see how you like it.